Having successfully hosted their first networking event earlier in the summer, the Jobshare Network pulled out all the stops for their follow-up event last week (26 November). 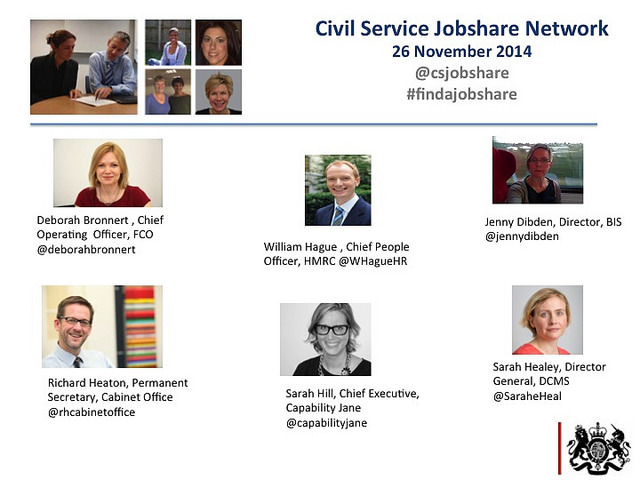 Guest speakers included an intro video from Sir Jeremy Heywood, and Q&As with Deborah Bronnert, the new Chief Operating Officer at the FCO, Richard Heaton, William Hague (Chief People Officer at HMRC rather than the other one), Sarah Healey (DCMS), Jenny Dibden (BIS) and Sarah Hill from the jobshare company, Capability Jane. The event sounded great and it seems to strike a very positive note. 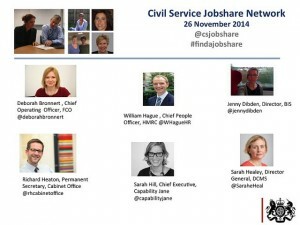 I've heard about a proposed Civil Service job share register or noticeboard to help people find job sharing opportunities etc. Was this covered at the event and is there any further news about it?